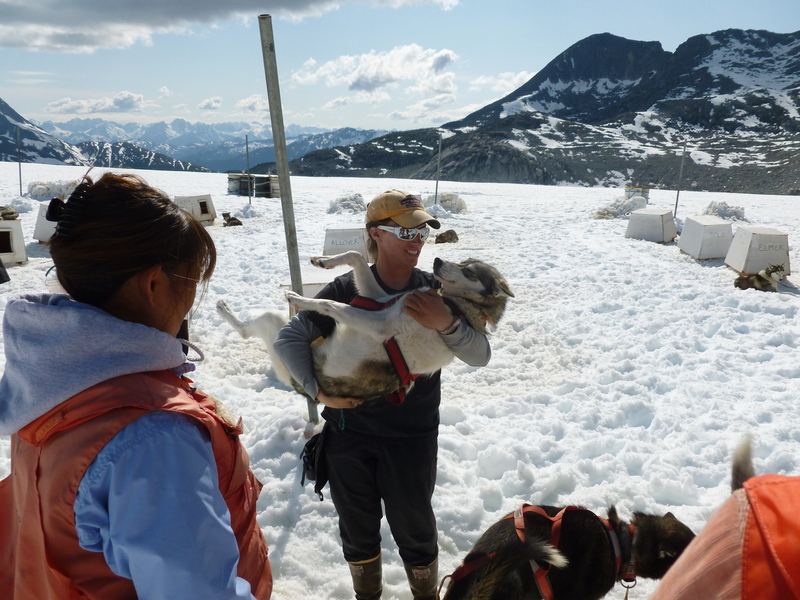 This is a “summer camp” for sled dogs to keep them in shape during the off season. 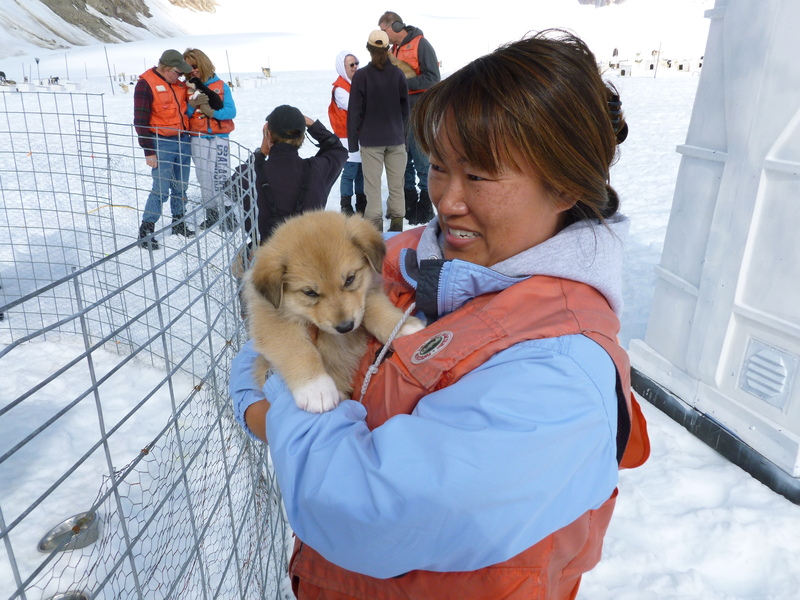 There are about 240 dogs in camp. We were introduced to our sled team. 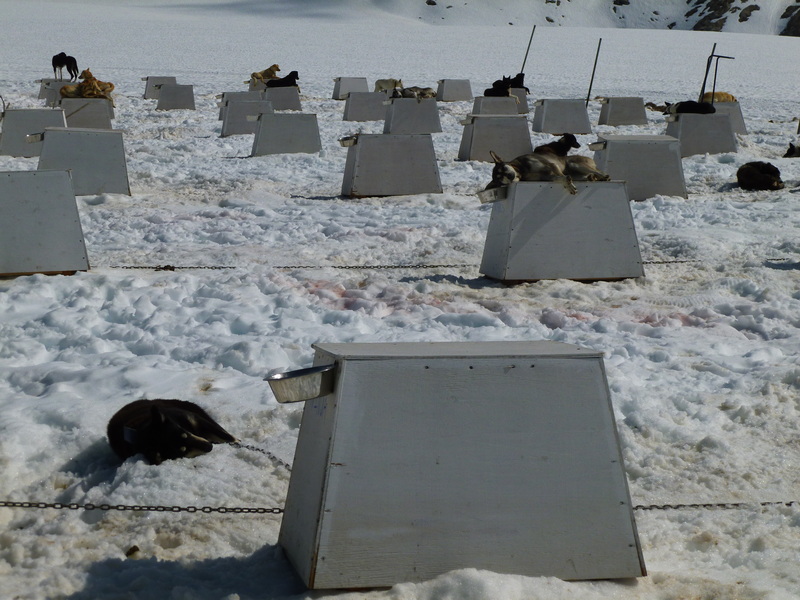 They were in a sort of “on deck circle” waiting to be attached to their sled. Each team is 11-12 dogs. The dogs were very friendly, each with their own story. 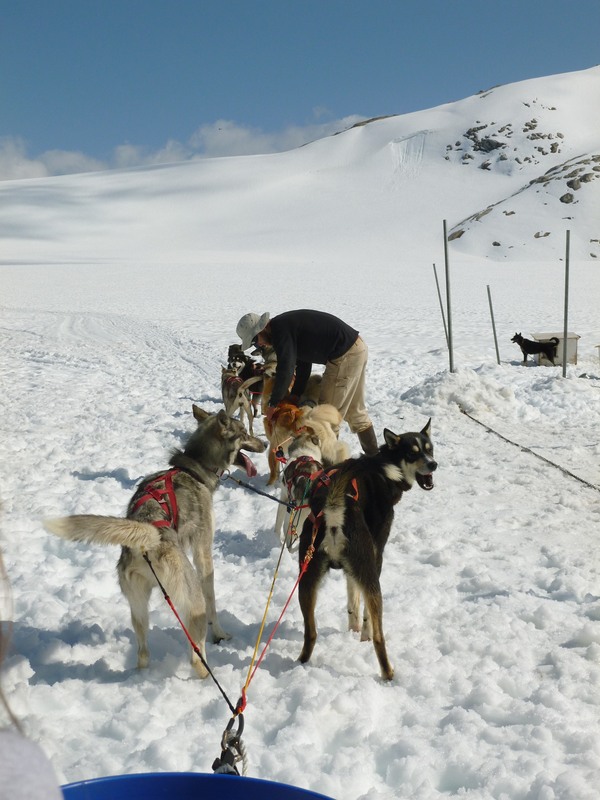 The dogs are Alaskan Huskies. 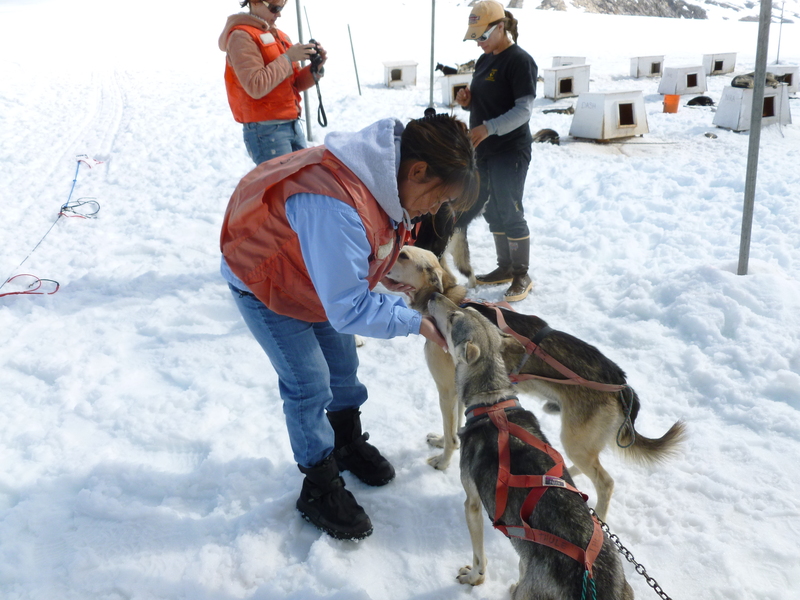 While not really a bread, most sled dogs are categorized as Alaskan Huskies, but are essentially mutts. They are bread to have traits similar to marathon runners – very lean and able to travel long distances without stressing the body. The Huskies we know are Siberian Huskies. 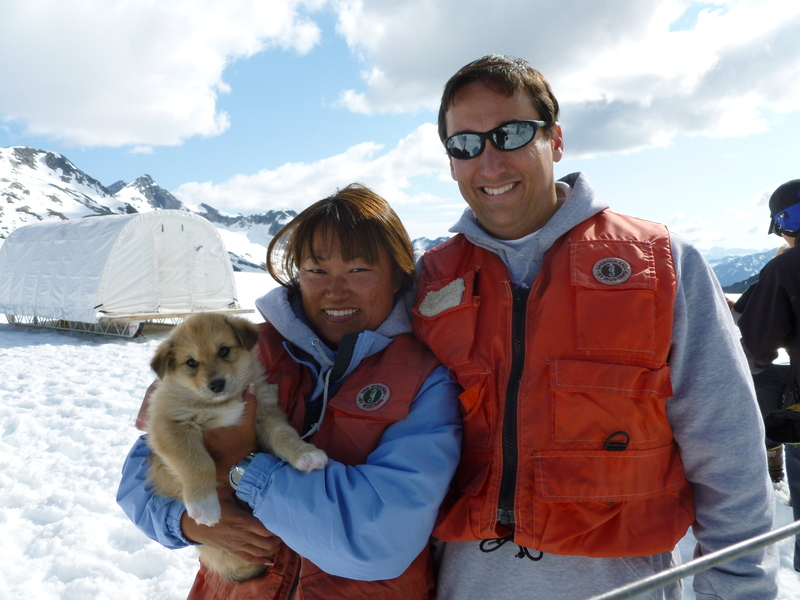 In Alaska they call them “Hollywood Huskies” because they are the most commonly depicted snow dog. 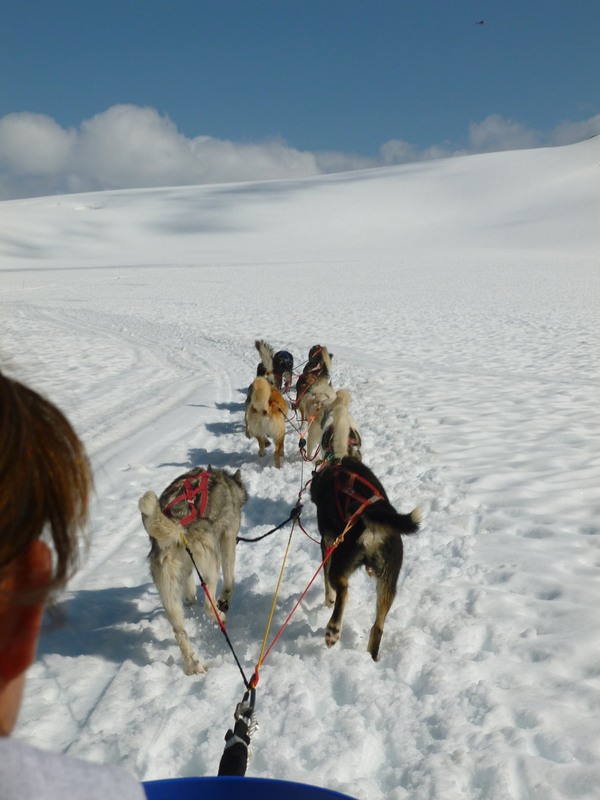 Siberian Huskies are good sled dogs for temperatures less than -50 degrees while Alaskan Huskies are best suited for temperatures of 0 to -30 degrees. 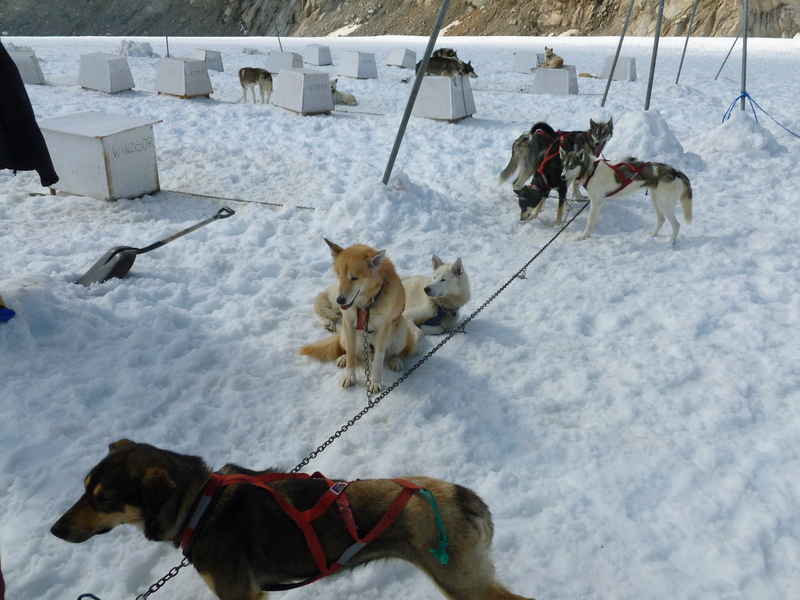 The dogs were then attached to our sled. They knew what was about to happen and were constantly pulling at the ropes and harnesses. 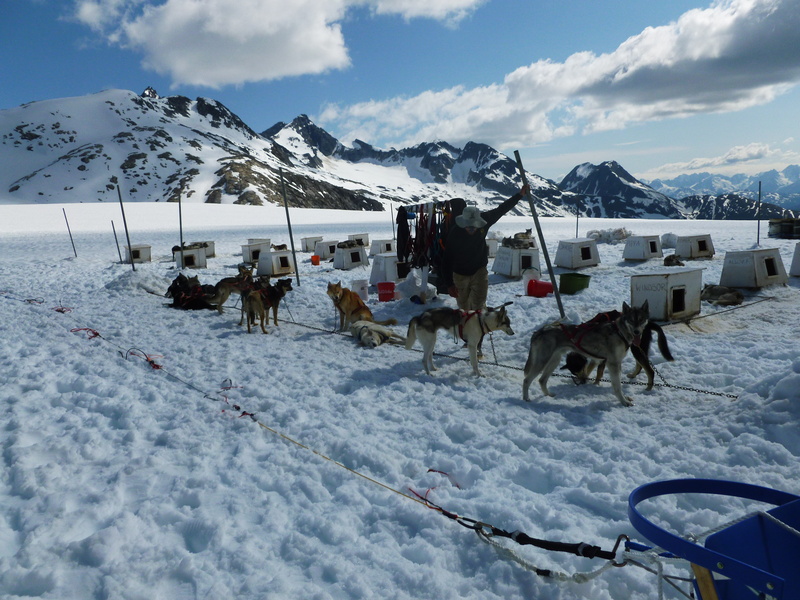 The dogs pull the sled at about 10 miles an hour. Like a marathon runner their gait appears effortless. 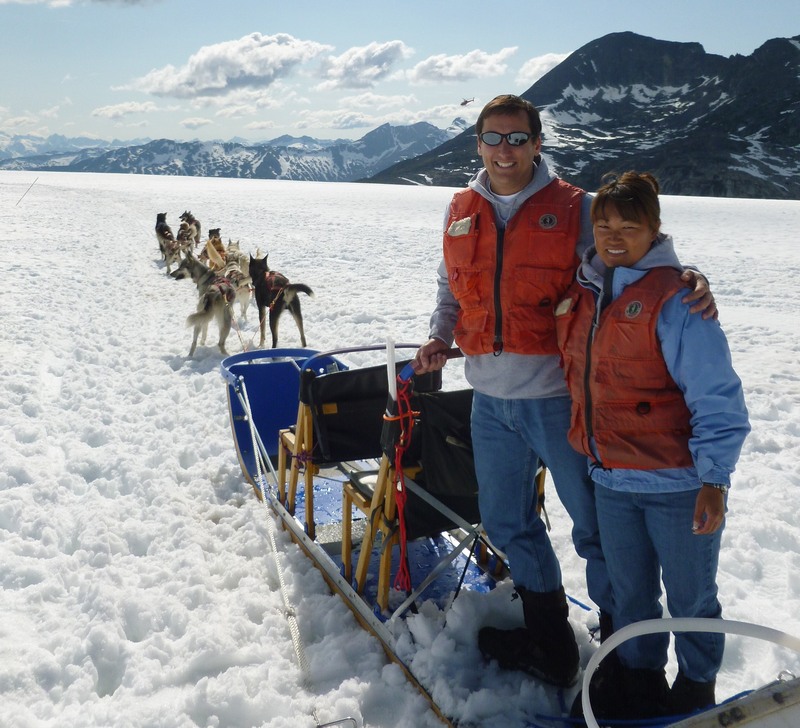 On the sled were four passengers and the musher. 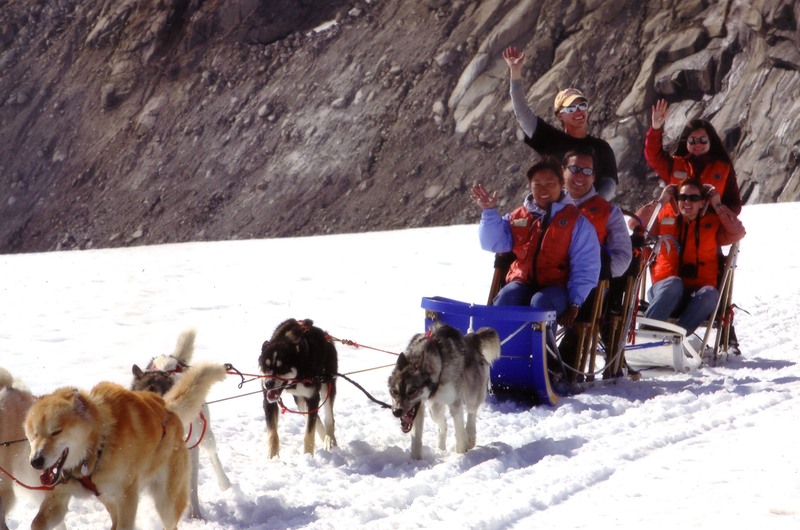 Each person got to take a turn in the front most seat of the sled as well as standing at the back of the sled. Every mile or so we would stop to switch positions and pose for pictures. I recorded video when it was my turn on the back of the sled. The video is really bouncy. We were going down hill so I had one foot on the sled and the other foot dragging the brake. 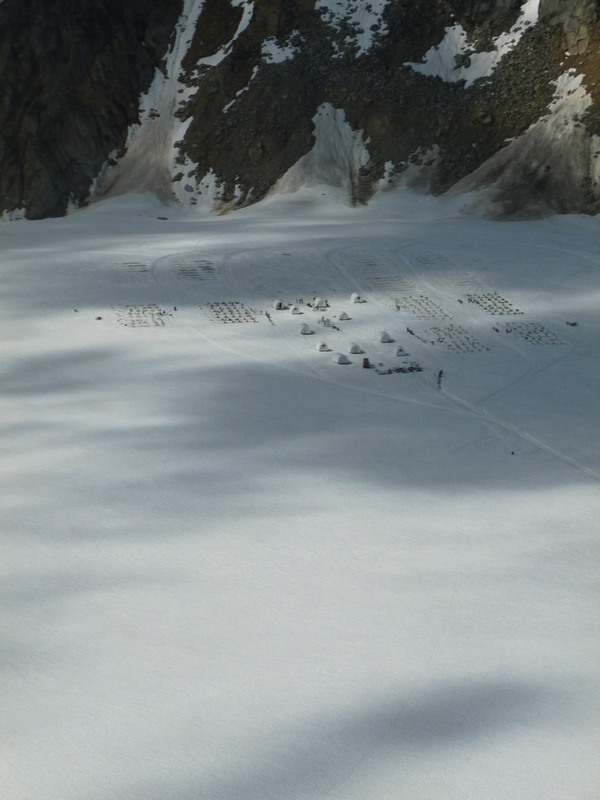 Plus there were a lot of bumps and ruts. 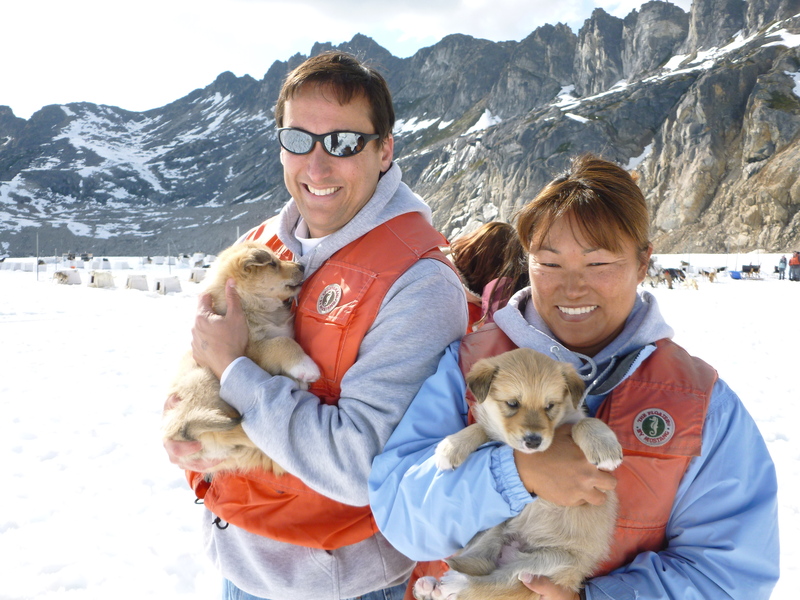 After the dog sledding was the “cherry on top”. In camp they had a mother and her four puppies. Of course they were very cute!